I have eclipse version: "Mars Release (4.5.0)"
After this I can see lombok.jar in my eclipse directory and eclipse.ini. But still lombok is not working for me. BTW: Make sure that you have lombok.jar in the eclipse directory. If it's a git project then delete the project from workspace and import the project again. or else export the project and then import it again Hope it helps someone! On mac os this is because the location of eclipse.ini has changed. Kepler and Luna used Eclipse.app/Contents/MacOS/eclipse.ini. Mars uses Eclipse.app/Contents/Eclipse/eclipse.ini. It looks like this has broken Lombok's Eclipse auto-detection as well. I just got the solution for this issue is as explain below. Once the jar downloaded in Local repository, goto the jar location from command prompt and run the following command java -jar lombok-1.16.18.jar and we should be greeted by Lombok installation window provided by lombok like this. 3. 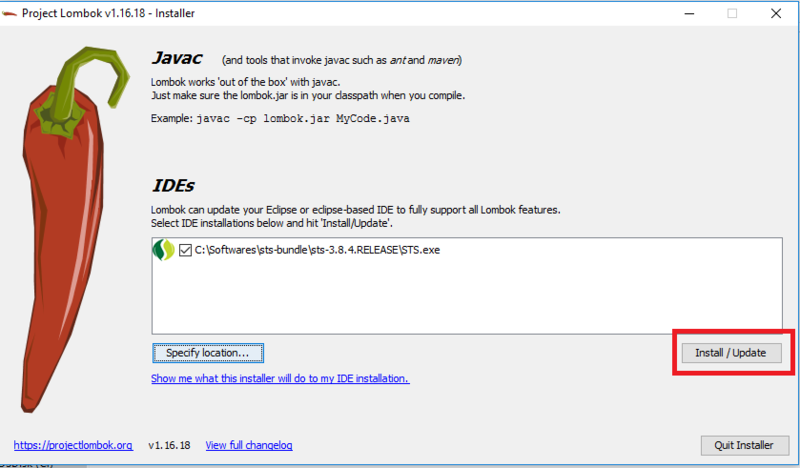 Give Lombok Install Path - Now click on the “Specify Location” button and locate the eclipse.exe/STS.exe path under eclipse installation folder like this. 5. Please make sure to add below entry into the STS.ini file, if its not already there. Note: After doing all this if this doesn't worked then make sure to change the workspace and build the code again. It will work. Have the same problem with Ubuntu 14.04, when I jump into eclipse directory and run the executable there, it is ok, however when the launcher icon is used, the entire eclipse.ini is being ignored for some reason. Had similar problem with Neon. The problem was that the version of lombok.jar installed in the Eclipse directory was not the same as the version specified in pom.xml. Not the answer you're looking for? Browse other questions tagged eclipse lombok or ask your own question. 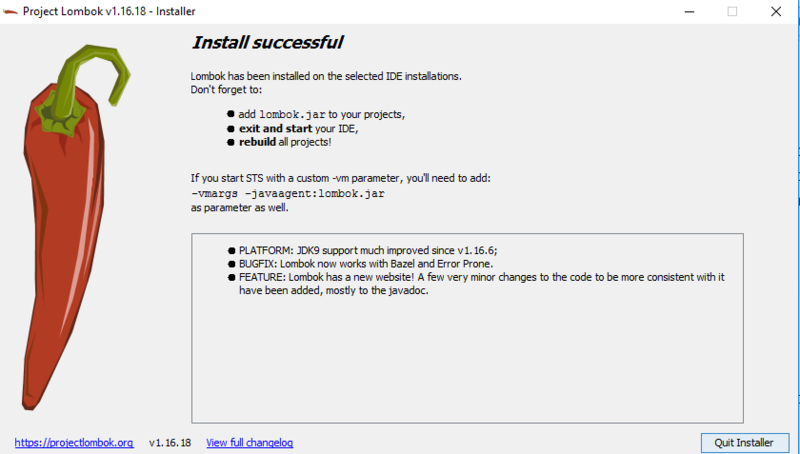 Why Eclipse needs to be configure for Lombok?